I have owned Room for quite some time now, but have only just gotten around to reading it. Until I read Astray, a short story collection that I read for Write Read’s Summer of the Canadian Short Story, I hadn’t read anything by Emma Donoghue, so I thought it was time. I was also curious about her approach to using a child narrator, having recently read The Bear by Claire Cameron. I liked it. I was impressed by her ability to write so much about two people in a little room for so long without it getting boring. In fact, it was quite compelling. I had never read anything dealing with this topic before, so I was intrigued and curious about where it was going to go. One reason it took me so long to get to this book (much longer than the rest of the world) was because I was a little afraid of the ick factor. I didn’t want to read about a little boy put into a creepy situation. But, for Jack, it was just his life. It was all he knew. He and his mother had developed a very close relationship over the five years they were alone in that room, and Jack was thriving under the circumstances. Jack’s mom got creative with the little they had. They made forts and other structures out of empty tins and containers, they had a long snake made out of eggshells, they played orchestra by hitting different objects in the room, they played a game called Parrot by ‘parroting’ whatever was being said on TV at the time. Everyday, they had “phys-ed’ by pushing the furniture to the side and running ‘track’, or playing ‘trampoline’ by jumping on the bed. She told him endless stories and taught him many songs and rhymes. Everything they did was either part of a deeply ingrained routine, or made into a game. TV was a big part of Jack’s life. Until he turned five, when his mother started to explain to him about the world outside their room, he thought nothing on TV was real; only the things in Room were real. When his mother started telling him otherwise, it was confusing and hard for him to understand. I thought Donoghue did a good job conveying this message. Women aren’t real like Ma is, and girls and boys not either. Men aren’t real except Old Nick, and I’m not actually sure if he’s real for real. Maybe half? He brings groceries and Sundaytreat and disappears the trash, but he’s not human like us. He only happens in the night, like bats. Maybe Door makes him up with a beep beep and the air changes. I think Ma doesn’t like to talk about him in case he gets realer. Skateboards are TV and so are girls and boys, except Ma says they’re actual, how can they be when they’re so flat?… Air’s real and water only in Bath and Sink, rivers and lakes are TV, I don’t know about the sea because if it whizzed around Outside it would make everything wet… Room is real for real, but maybe Outside is too only it’s got a cloak of invisibility on like Prince JackerJack in the story? Outside has everything. Whenever I think of a thing now like skis or fireworks or islands or elevators or yo-yos, I have to remember they’re real, they’re actually happening in Outside all together. It makes my head tired. And people too, firefighters teachers burglars babies saints soccer players and all sorts, they’re all really in Outside. I’m not there, though, me and Ma, we’re the only ones not there. Are we still real? As hard as it would be to write about being inside the room, imagining what it might be like for them after coming out would be even harder. After being alone in a room with his mother for the first five years of his life, what might it be like for Jack to suddenly be on the outside? So many new people and experiences, and to have to share his mother with them all? I was struck by the fact that the adults were assuming that Jack felt safer now that he was free, just because they knew him to be. But, for Jack, the real world felt so much more scary, and a big part of him just wanted to go back to Room and everything that was familiar to him. I enjoyed reading this book from the point of view of five-year-old Jack. When an author is able to imagine the inner workings of a child’s mind, the result is that we get a unique perspective on a story, as well as some insight into the mysteries of a child’s thoughts. No matter what your opinion is on child narrators, it has to be acknowledged that it would be hard to do, and I am happy that Emma Donoghue took the risk. In my opinion, it paid off, resulting in a unique, thoughtful story with a satisfying ending. What’s your opinion on writing from the perspective of a young child? What other books have you read and liked that have used this style? I really enjoyed reading Frog Music, although I didn’t LOVE it, but I’m interested in her writing and will definitely consider reading ROOM next. I think it’s very different from Frog Music, although I haven’t read that one yet. But, still good writing, and an original story (in my opinion!). I’ve had a mixed reaction to Donoghue. I have liked some of her books but not liked others. I’m still not sure about this one. I was unsure about this one, too, for a while, because of the subject. But it wasn’t nearly as upsetting as I thought it would be (or as many other books I have read), so I am glad that I read it. Well, thanks for the review. This one was a great novel and I heard her read from it when it first came out in paperback. She was inspired by Roddy Doyle’s Paddy Clarke Ha Ha Ha which is also a phenomenal book narrated by children. Oh, thanks, that’s good to know! I will have to read that one. 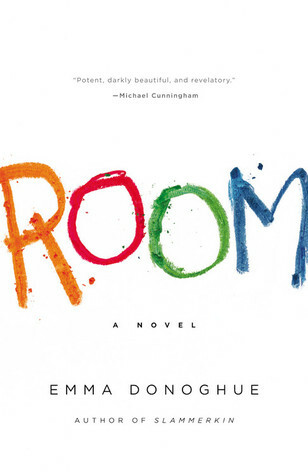 The “ick” factor is still stopping me, but I’ve heard nothing but praise for Room. Thanks for making it a bit more approachable! I have been impressed and enlightened by the reviews (mostly favorable) and reactions to Room more than the experience of reading Room myself. But I’m glad I did read it. Our club read it; some really liked it and quite a few didn’t. It was an interesting discussion. It would definitely be a good book for discussion! I’m glad to know that it wasn’t as disturbing as you had feared. Normally this is the kind of book I’d grab immediately, but I too was afraid of the subject matter, especially since my own son wasn’t much older than the boy in the book when it first came out. I think I’d like to read this sooner or later, if only to get some insights into a child’s mind. That perspective doesn’t bother me, as long as it is done well and realistically. I guess I wasn’t the only one who was wary of reading this book. But, I am glad that I read it. It is definitely worth reading sometime! I haven’t read this book (afraid it would be too disturbing) and I am not fond of child narrators as they usually come across as either too childish or too smart. It looks like Donaghue did a really good job with this one though. If it isn’t done well, I can see a child narrator grating on the nerves. Even in this case, there were certain things that still did. But, for the most part, I liked it! I’ve also been putting this off for fear it would be too creepy. The narration you shared seems really well done to me, but it seems like Jack’s ignorance of is own situation could be heartbreaking. Tt sounds as though you enjoyed this despite your original fear of the ick factor and that makes me a feel a bit braver about possibly picking it up myself. It definitely wasn’t as bad as I feared, and I was glad to have finally read it. I think seeing it from Jack’s perspective made the story easier to take. On my wish-list!! It’s being a Booker Prize nominee,I am sure Room will be a unique read,just as your review suggests! I haven’t read too many books in which we see the world through the eyes of a child,with the God of Small Things (Booker Winner in 1997) and To Kill a Mockingbird being the only two.Given that they both are little gems which rank among my favourites,I guess I like this style! It’s good to know that you liked The God of Small Things- I haven’t read that one yet. I hope you end up liking Room! Thanks for the visit and the follow! Great review! I haven’t tried reading this book yet because of the whole 5-year old narrator thing and the situation he’s in with his mother, but your comments made me think I could read this book. If I can, then so can you! Unless it’s the child himself who irritates you. I find that after you get into it, you just get used to it.